About 50% of the world's population lives in an urban environment. It is likely that is true of the Pagan population as well. If your path is Earth- or Nature-based and you city in a big, noisy, polluted city, connecting with nature can be difficult. Fortunately, you don’t have to live in an isolated cottage in the middle of a forest to make the connection. For those of you living in an urban environment, there are ways to connect. It is easy if you have a small yard. I have a friend who lives in an urban environment who connects by maintaining his yard as the neighborhood weed patch. Few of us though can interact through neglect. If you do have a small yard, you can devote part of it to the craft. Maybe start with a small herb garden. It doesn’t take a lot of space to grow herbs, and, if they are perennials, it doesn’t take a lot of time once the garden is established. Just make sure the herbs are suitable for your climate. If you like, you can add religious symbols. For example, one can find in the jungle known as our perennial garden, the solar disk nestled between the flax and the fox glove.If your lot is big enough, you can add some vegetables and maybe even an apple tree. 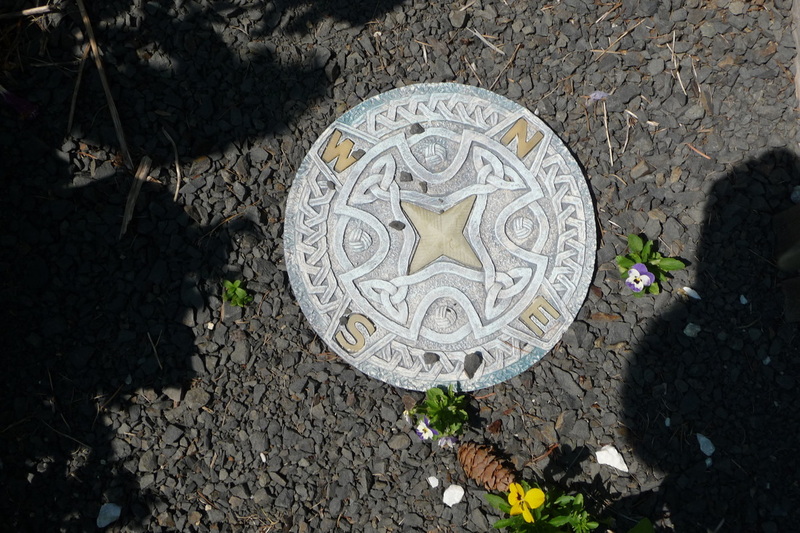 Even just a plaque with Celtic knot work in your garden strengthens the bond with nature. What about apartment dwellers? Even in an apartment, miniature gardens can work wonders for bonding with nature and for healthy cooking if you grow some of your own herbs and/or vegetables. Trying buying or making an upside down tomato grower . 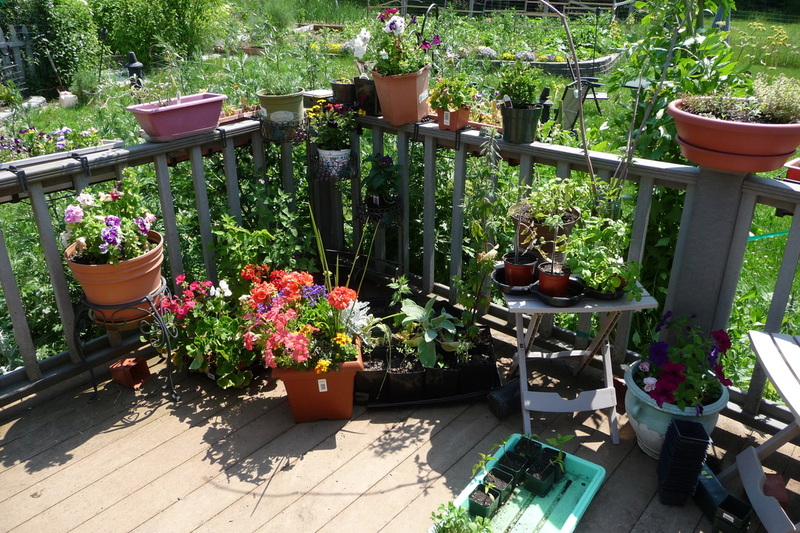 If you have a patio that gets sufficient light, you can grow a selected assortment of herbs and/or magickal plants. A geranium at the entrance to any occultists home is quite protective and promotes health. Many herbs don’t take up much space either. 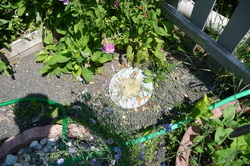 The corners of our deck are dedicated an annual and tender perennial plants like heliotrope, geraniums, herb pots, etc. It is always a work in progress, which helps with the connection. Most low-growing herbs like basil do well in pots. Don’t have an outside patio? Unless you live in your mother’s basement, you probably have a window. 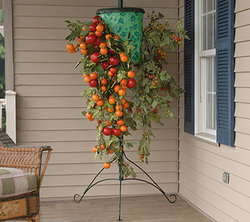 Buy a plant stand and put your green thumb to work there. Use hanging baskets. Ah, but what if you have a black thumb? What if, like one of my internet friends, you are the Grim Reaper of all things vegetable? Try buying fresh herbs and keeping them in a vase of water. You can slowly harvest what you need for cooking. Or keep fresh cut flowers around the house. Plants are such a magickal part of our existence. They clean the air adding more oxygen, and they are calm and soothing. All they need is a little water and attention. You can enhance your bond if you sing or talk to them. Another way to connect is by visiting a public park. Sit with your back up against your favorite tree, close your eyes, and ground yourself. It is very therapeutic. If the park is well-maintained, go barefoot; feel the pulse of the earth under your feet, the kiss of the breeze on your check, the warmth of the sun on your face – even the drops of rain if the weather takes that kind of turn. If you can, find a place that is not overrun with screaming urchins, yet is safe from the undesirable crowd that sometimes inhabits city parks. Let yourself slip into a light meditative trance and feel the ancient strength of stone beneath you. Take every opportunity to get into the wild places closest to your home. This may be a lot easier for some than others. Make offerings there. Do a small private ritual just to connect back with the Earth. Take a blanket and lay down, watching the sky, listen to the birds, the sounds of the natural world. A picnic lunch and bottle of mead can help too. You will go home rejuvenated of spirit. And when you get back home, try to keep grounded. Avoid chemically treated water and food. Live as naturally as you can in the environment you are in. You will find it is healthier for your spirit.